To Keep Their Relationship Passionate and Exciting, Married Couple Teams Up on Web Action-Adventure for All to See. We're just like the millions of other couples out there struggling or holding off starting a family in this economy while trying to keep our relationship close. "Vexika" a futuristic SciFi reality web series, was created by a husband and wife looking for a fun and creative way to keep their marriage passionate and adventurous while pushing the limits of what a close working couple can accomplish on the weekends, without killing each other. "Vexika" follows Victoria Bloom, an ambitious Channel 4 TV reporter who loves playing games on her console, is secretly engaged to her cameraman and is also DARPA's only successful experimental nanoid-hybrid biological cyber-enhanced supersoldier. She must hunt down the deranged failed rejects of the project every month to feed her fatal nanoid adrenaline build up - Vexika Season 1 Trailer. Personal home videos are incorporated around each storyline with their ultimate goal being the creation of a "...realistic, inimitable and sometimes steamy" show that is watchable in one or two minute Internet-paced "micro-sodes", showing how one couple is keeping their relationship exciting and new. "Last year's wedding anniversary was at the Grand Canyon, so that's where the first half of Vexika™ Season One takes place." The role of Victoria Bloom (aka Vexika) is played by Miranda Stewart. You may have seen her diligently working Monday through Friday in her exciting HR position while taking an occasional college class to further her education as well as coordinating dinners at home. "One of the best things about doing this, is that it motivates me to stay in shape and plan better meals because we're on camera. When my husband suggests pizza, I tell him I have to keep in shape!" 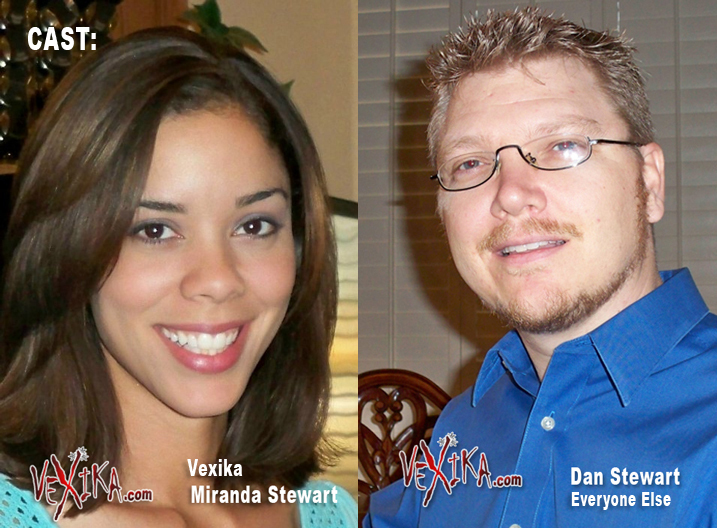 The rest of the cast of Vexika characters, as well as writing, directing and post production work, are performed by her husband Dan Stewart. He describes the pace of the show as trying to, "...blow your face off - two minutes at a time." Dan employed thousands between 1996 and 2008 before the poor economy helped sink his business - consequently giving him the opportunity to professionally pursue his first love of film, illustration and graphic design full-time. "We're just like the millions of other couples out there struggling or holding off starting a family in this economy while trying to keep our relationship close. You get consumed only focusing on making ends meet. We thought this would be a great way to come together and keep things lively and maybe even spark others to discover and share their own ways of keeping things fun in their relationship too." Half the show is in the making (or surviving) of it. Have a look at Vexika Behind The Scenes 1. "We’ll pursue other media avenues and do a bigger production or maybe a comic book series with Vexika one day - but for right now, we're having a blast." Join the Vexika Update List to be notified of exclusive private content leading up to release day, invitations to live online events and priority on any limited editions.